In the last post I spoke about the Magnum Lynx 8.0. Now I am going to talk about the Magnum Lynx 8.0 side zip boots. The Magnum Lynx 8.0 side zip boots are new in the new Magnum range. Magnum just released a new type of boot called the Lynx boot. This has been added to there massive collection. This is a good thing if you are a fan of Magnum boots as now you have even more choice. This boot is on of the quickest boots I have ever used and I will explain what I mean by that in this post. The Magnum Lynx range has a very nice modern look to it. Just Like the Magnum lynx 8.0 boot this boot has very similar looks. It is made from tough leather and nylon to be breathable as well as durable. It has a very modern carbon look to it but at the same time looks professional. The eyelets have a metal look to them and again are very tough. The side zip on the boot does not look big and bulky and out of place. I think the side zip on this boot stands out from most as it actually fits in to the look and style of the Magnum Lynx 8.0 side zip boot. Like all Magnum boots on the market this boot has a lot of technology to it. Magnum make there with the task at hand in mind. 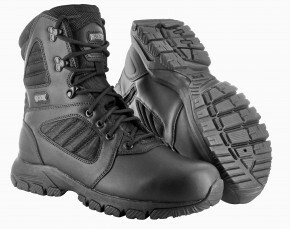 The Magnum Lynx 8.0 sz boot has been designed to be one of the most perfect patrol boots out there. All of the hard wear of this boot has been designed to be durable and rust proof. This was done to make sure the boots have a long life for the wearer. Inside the boot all the material is designed to control the moisture and temperature of your feet. This is done by using material that wickens moisture. This is great as your feet will stay at the perfect temperature no matter how long the shift is. They are one of the quickest not by the speed you can run in them but how quick you can get them off and on. They have a quick on/off hook lace system as well as a side zip. This is on of the fastest I have ever managed to get a boot on and off in my life. It is really good after a very long shift. 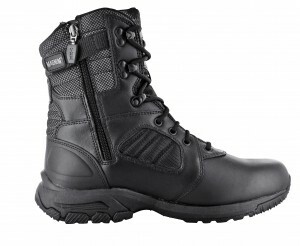 Magnum Lynx 8.0 side zip boots – where to buy? First off, if you are a fan of side zip boots you NEED to get a pair of these!! They are by far one of the best side zip boots I have used and I am not a massive fan of SZ boots. As these are new upon writing this there may only be a few places selling them. I advise you go to a trusted Magnum dealer like Patrolstore.com – Magnum Lynx 8.0 SZ Boots . The Magnum Lynx 8.0 side zip boots are a great pair of boots.